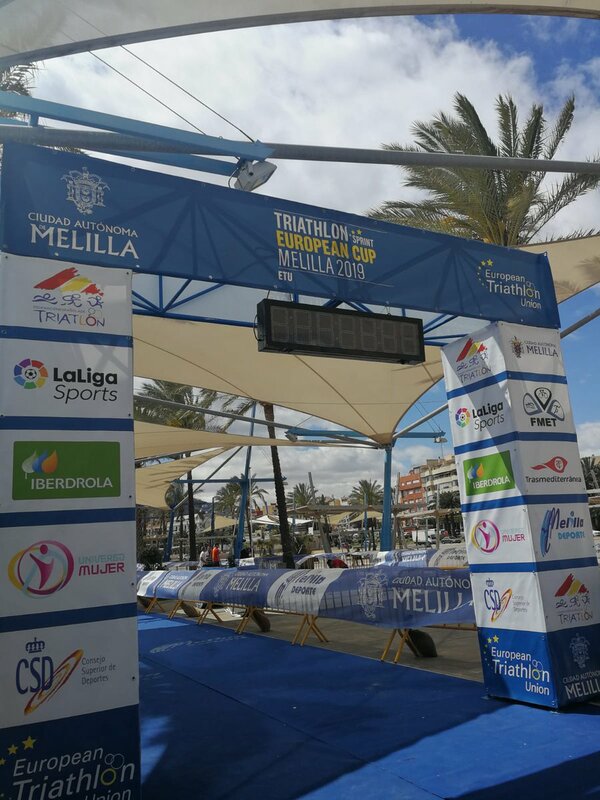 The focus this afternoon in Melilla, as the roads were gradually closed down for the ETU Melilla Junior and European Cup events, was of course on the many athletes who had travelled from far and wide. For some, the tension was building rapidly as their bikes were held somewhere in limbo by confusing baggage-handling. Yuliya Yelistratova was looking at an empty space in her room 5 hours before the start. Definitely not the best way to prepare for a race. At the time of writing, ETU Media does not have any confirmation that her bike has arrived. Turning to the Juniors, it was the Junior Women who raced first. Not the best weather conditions, but it was the same for everyone. 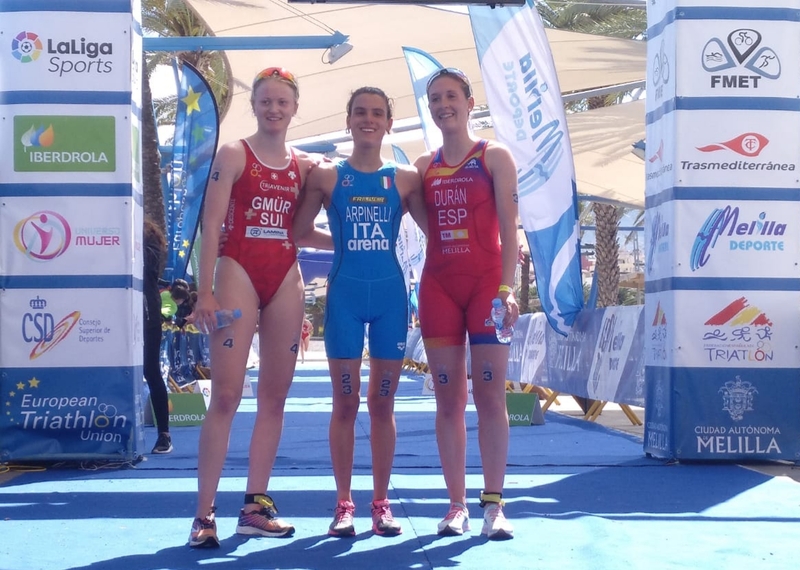 It was Bianca Seregni ITA who led them out of the water with a comfortable lead of 9 seconds over Iratxe Arenal Arribas ESP. Eva Daniels LUX, was a few paces behind and then came the pack of athletes, rushing up the beach, through the showers, turning right into transition and ripping off the wetsuits. Officials watched carefully to see that no advantage was gained by discarding equipment outside the designated boxes and then they were off. The bike course takes the athletes away to the North and towards the city centre, before returning past the long transition area. A great bike course that allows spectators to cheer on their favourites as they whizz past. Soon enough the stronger cyclists edged forwards and it was now Magdalena Sudak POL, leading Arenal and Seregni, with Daniels pulling along a couple of Spanish athletes. Some way back was Julia Sanecka and Nora Gmür SUI, with Costanza Arpinelli ITA, reigning World Junior Duathlon Champion, tucked in nicely. As they settled into their rhythm, it was once again Seregni who took control, with Arenal alongside and, pushing them was Daniels, now joined by Laura Durán Morote and Arpinelli. With Gmür, Sudak and Sanecka, this was the lead group, a fraction ahead of a chase group that was in danger of being dropped. This group worked well and soon established a lead of nearly 20 seconds. 7 athletes would be working hard to escape and create the lead that would ensure a run to the podium but who, amongst them, would have the power and pace to get those three medals? On paper, it had to be the Italian Seregni but with a wealth of new talent here, the stats might not be so certain. Maintaining and building the lead and sharing the work at the front, this group of 7 were being chased by Esther Gómez González ESP, who was really in no-man’s land, some 25 seconds away from the leaders but 25 seconds ahead of the main peloton. Despite the hard work from Gómez, she could not quite catch the leaders, who were working well together to keep their advantage. With a 40-second lead now, there seemed to be no doubt that the medals would come from this group. Getting close to T2 and the lead had extended to over a minute. Gómez was in the sights of the peloton, her hard work out there alone had been for nothing. Into T2 and it was Gmür who led them out, with Durán, Daniels, Arpinelli and Arenal not far behind. Last out was the Italian, Seregni. Gómez had somehow managed to keep ahead of the fast-moving chase group but was still over a minute behind the leaders. So now, only 5k to the finish and it would be a chance for the coaches to see how well their athletes had been able to balance the hard work on the bike against the need to run easily off the 20k of technical road-riding. Gmür’s acceleration from T2 was not enough to break away and soon it was Italy’s Arpinelli who came up to, alongside and past to take the lead. In no time at all, Arpinelli had established a 20 second lead. The Swiss athlete had Durán for company and with these three out in front, it was going to be a big ask for Seregni to get a medal from 40 seconds back. Further behind was Daniels. Points assured but medals looking unlikely. As a World Champion duathlete, running off the bike is always important. Arpinelli had raced well and crossed the line a comfortable 39 seconds ahead of Gmür, whose last podium was in 2017 in Bled. Durán’s race in Liévin was a signal that she can generate explosive power over short distances and that served her well today, to take the bronze medal.